I guess Mexican was the first "ethnic" food that I learned to cook. When I was living in Miami, I was at a party where a co-worker named Nancy Kowalski made a quick and easy sheet of nachos by putting tortillas on a cookie sheet, added a can of Hormel Chili (without beans), some shredded cheese, onions, scallions, and after about five minutes in the oven, she brought out some delicious nachos. I had heard of nachos before that (Old El Paso had a box of tortilla chips called "Nachips" that had a recipe on the back), I never tasted it until that time at Nancy's. I taught the recipe to Sandra (this was before we were married), and together we learned to love Mexican food. I believe that Mexican is still Sandra's favorite restaurant cuisine. To this day, the nachos inspired by Nancy's quick and dirty party meal make up a quick and easy meal. We've refined our style (sliced green onions and freshly chopped tomatoes make up the bulk of the "vegetable" ingredients), but it's still basically the same recipe. When I was learning to appreciate Mexican cooking, I initially avoided guacamole. The pale green color and dip-like texture turned me off, as I was never really a fan of dips. In addition, I never tasted avocados before, and wasn't willing to give them a try. One day at lunch, I saw a news segment on channel nine (WMUR, Manchester) where a local chef makes a recipe, and the recipe was for guacamole. I believe that the chef was from a Mexican restaurant in Nashua called "La Hacienda del Rio." The chef wasn't too particular about quantities, saying pretty much that it was all a matter of taste. I watched as the chef quickly and professionally assembled guacamole from avocados, onions, and other ingredients. A few days later, I needed to whip up something quickly for a company outing (everybody was supposed to bring something). I remembered seeing the chef on television, and decided to make the guacamole. I went to the store to pick up some avocados, tomatoes, red onion, and limes, and at home, my daughters and I did the preparation and combined everything in a food processor. The kids tasted it and loved it, and it was a pretty good hit at the party (there weren't any leftovers). Since that time, I've read other people's recipes for guacamole, and made some tweaks to my recipe. My daughters have picked it up and made the recipe their own, and they are now my go-to people when I'm too busy to make it myself. Occasionally, I add sour cream for a creamier texture, but just as often I'll omit it and leave the texture a bit more "rustic." It all just depends on how I feel whenever I make it (I don't think Harmony or Chardonnay ever use sour cream when they make it, but I may be wrong). I've seen recipes for guacamole online and on television, and I've finally settled on the following recipe, which is one that my family and I like very much. It's wonderful with Tostitos™ Scoops tortilla chips; the scoops are the right size and perfect for dipping. 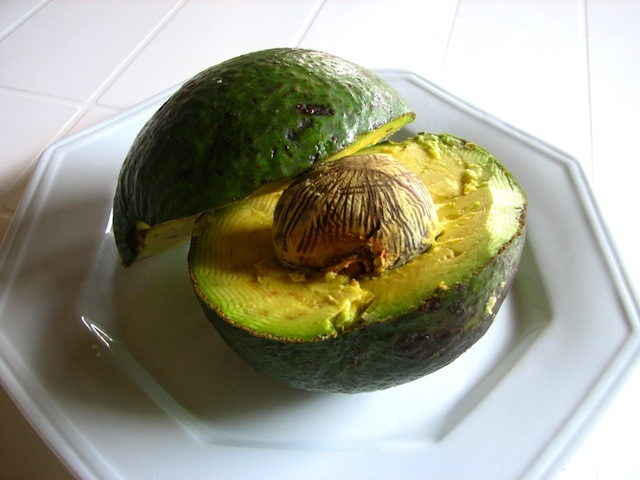 Peel and seed avocados, and cut in half or quarters, and place into food processor bowl. Add onion, jalapeño, most of the lime juice, and tomatillos, and cilantro and pulse until the mixture is thoroughly mixed—do not over-process. Put in serving bowl, and top with remainder of lime juice (to keep the avocado from oxidizing). Cover with plastic wrap and refrigerate until ready to serve. Before serving, stir the dip to blend in the lime juice. Tomatoes may be substituted for tomatillos, but will alter the color from bright green to light brown, which may be unappetizing. Consider dicing the tomatoes and mixing into dip right before stirring. Sour cream may be added to extend the dip for larger quantities. I prefer Vidalia onions over red onions, but they aren't available year round. Other sweet onions may be substituted. Green onions, both green and white parts, sliced thin as well as extra chopped cilantro make good garnishes.